Guess what time it is? Time for Themed Furniture Thursday!! Are you excited? Because I am excited to share my makeover with you! This month’s theme was “two-toned”. My harlequin bench that I just shared last week would have been a perfect project for this theme with its yummy Paris Grey against bright white. I found this beauty just as it was being rolled out onto the floor of a local thrift store. I waited patiently for the guys who rolled it out to come back and price it…$69!!! I have seen several of this exact piece in local antique stores for $400+! Now I know someone out there is thinking that I’ll never get that for it now, and I ruined it. Although this piece was in great condition, it had no charm and no character, which I think paint really adds. Ah so light and pretty now! 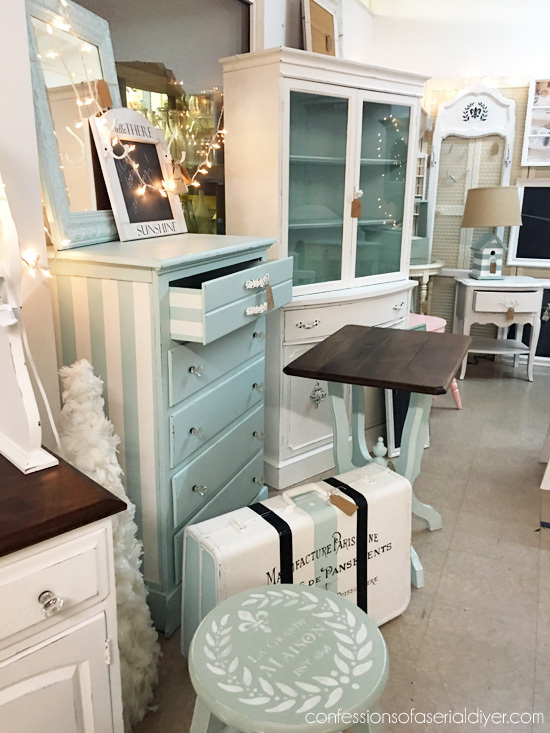 The outside is Chalk Paint® Decorative Paint by Annie Sloan in Pure white and the inside is a mix of Pure White and Duck Egg Blue. 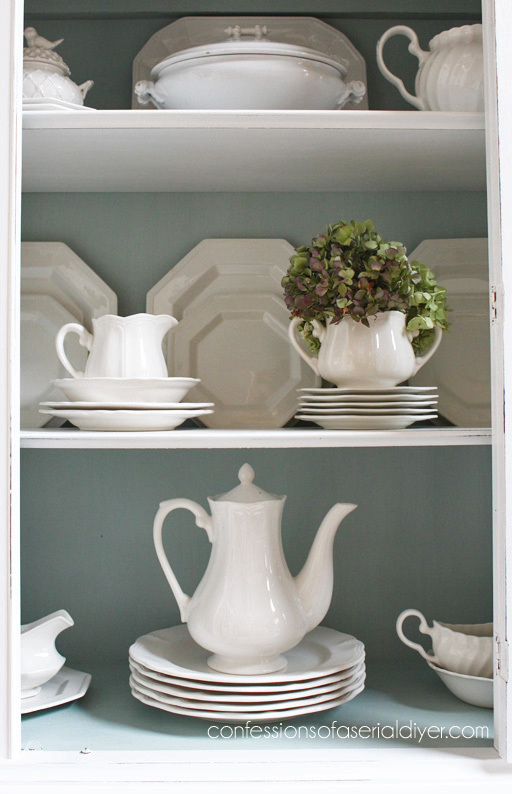 The blue is subtle and makes for the perfect backdrop for my thrifted ironstone! This fella was stubborn though. It bled through like crazy. (Maybe my punishment for painting it?) I know that mahogany usually requires a coat of shellac prior to painting, but now I know that cherry bleeds through like mad also. 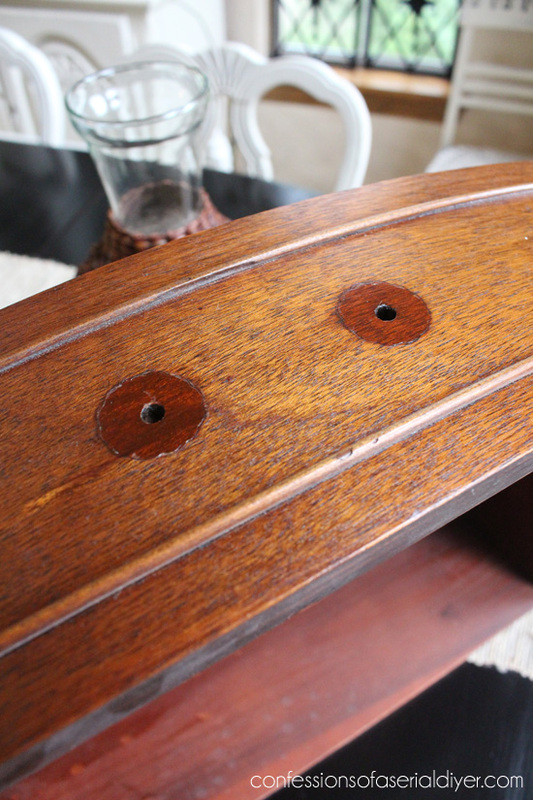 I ended up shellacing twice and then spot priming in certain areas where the stain was still trying to come through. That took care of it and I was on my way once again. I love how it turned out. So light and soft, if a furniture piece could be considered soft. I didn’t go too crazy with the distressing. Just a light sanding on the edges to bring out the details. 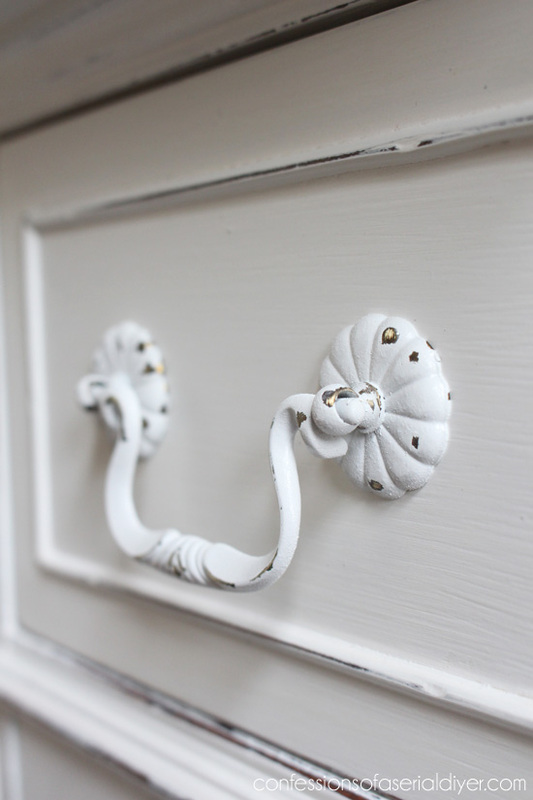 I used the original drawer pulls after spray painting and sanding a bit. They turned out pretty with their new coat of paint and I don’t mind at all that the brassy color is peeking through. I do wish there was a light inside the cabinet. The glass is reflecting the darkness of the other side of the room. Bold, Travel, Metallic, Flowers, Numbers, and most recently, Decoupage. Several of my blogging friends are also sharing two-toned furniture makeovers today! Hope you enjoyed this makeover! Oh my goodness, that piece turned out just BEAUTIFUL! Gorgeous!! I agree, painting it white/blue really softened it up. It’s really lovely! It’s beautiful Christy and worth all the extra work it took to stop that bleed though!! 😉 I am so loving the Pure White lately!! Your’s looks fabulous with the white dishes. Perfect. Are you keeping that there instead of your other cabinet you had in it’s place? Thanks, Nancy! I’m so glad I finally got it done. I love this one, but my old cabinet is in Old White and matches my dining set, so unfortunately I won’t be keeping this one. It will go in my new booth. Not sure what to price it at yet though! Oh my goodness, I’m in love with this piece! It really does look soft and just so pretty! Those colors work perfectly together and it’s the perfect complement to the white ironstone (of which I’m also a huge fan, lol). $69.00 are you kidding me!!!! I would have been doing the happy dance all over that thrift store floor when they slapped that price tag on. You’re right Christy, it is a beautiful piece of furniture but had no personality. You’ll probably get some hand slapping by the wood lovers but what you did with it is stunning! I love this color combo…and I love your rug!! You got a great price on that piece of furniture and I’ll bet if you hadn’t waited for it that it would have been gone when you went back to that store. I like the look of the white paint on the outside and blue on the inside. It now looks like such a feminine piece. So pretty! I love the colors you used! Great job! GORGEOUS! I love the white/duck egg combo! 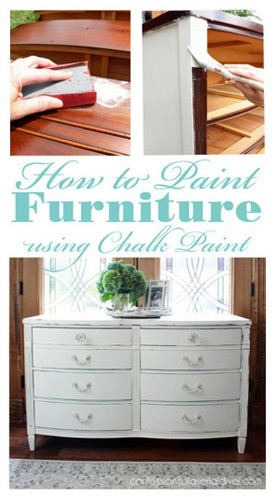 I just bought a quart of ASCP Duck Egg Blue last week that I plan on using on our coffee table and I cannot wait! Incredible makeover. What?!What?! $69?! She looks like a million bucks now. Gorgeous makeover Christy! Oh my goodness Christy! This is fantastic!!!!! I love blue and white together and this combo makes your white china just pop! Fabulous job my friend! I love your after! Your piece is stunning and I see nothing wrong in giving it new life and a place in your home..what steal for $69! Your vision is of course ..priceless! Again you pulled off a super makeover. Love your two tone project friend! 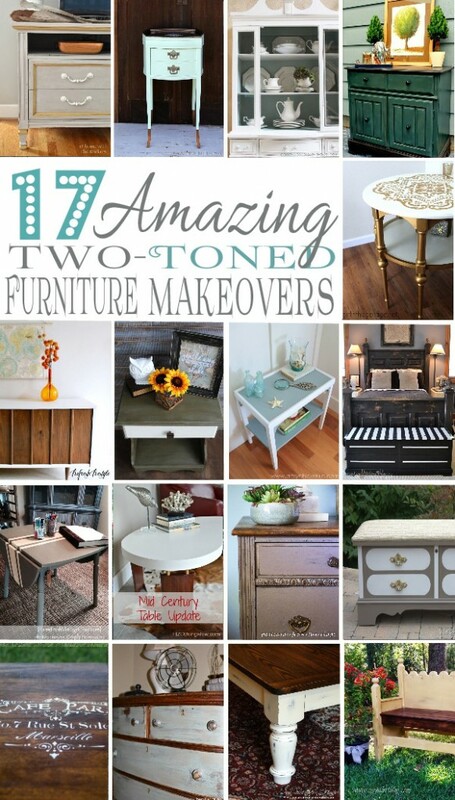 From an ugly duckling to a beautiful swan…gorgeous piece of furniture! Wow, that looks stunning! And how could you NOT get it at $69?!? Beautiful work! 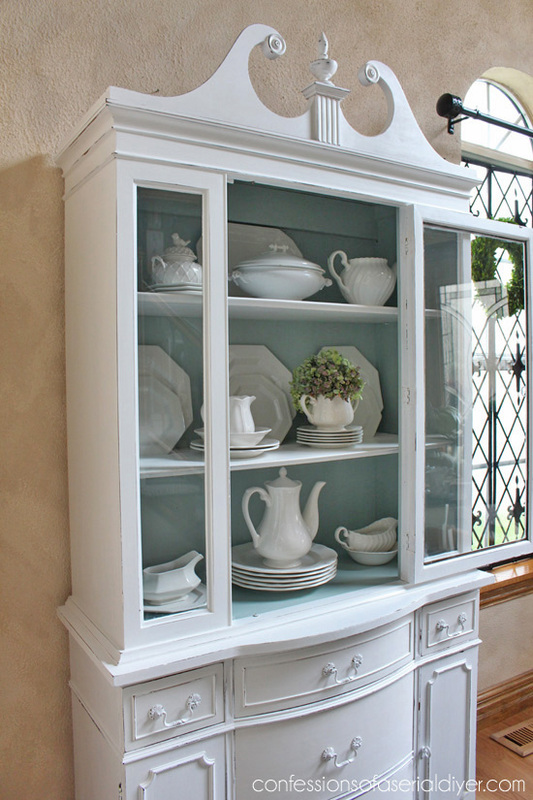 That china cabinet is gorgeous. Love it. Super pretty Christy- and I love the blue of the background. It really makes your beautiful white dishes pop!! what a perfect colour combination. The finish you acheived is just beautiful, I love everything about this! beautiful! I think you should add a light/lights to the inside. Since the shelves are solid, you could add lights vertically along the inside doorframe, and the sidelights on either end. 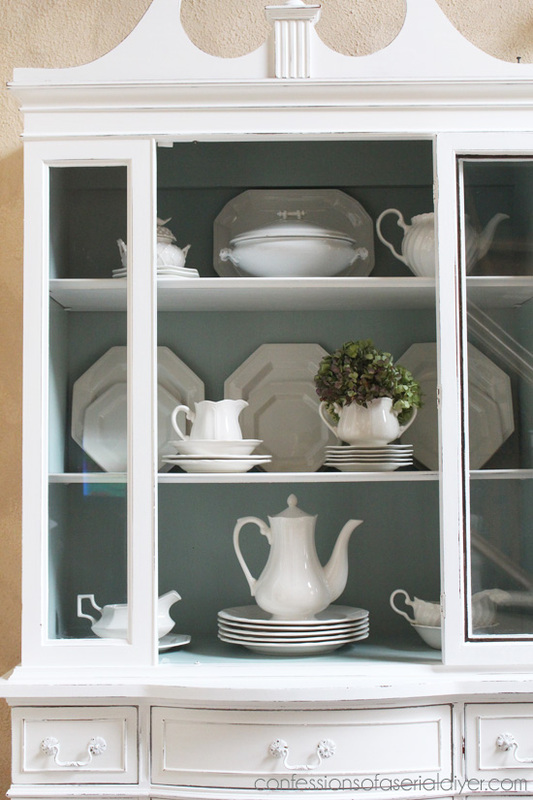 We did this on glass fronted cabinets in a butlers pantry, and it made all the difference. If you only added one to the “ceiling” the light probably wouldnt go beyond the top shelf, since it is not glass. I would love to figure out how to add lights. It would really make the dishes shine! 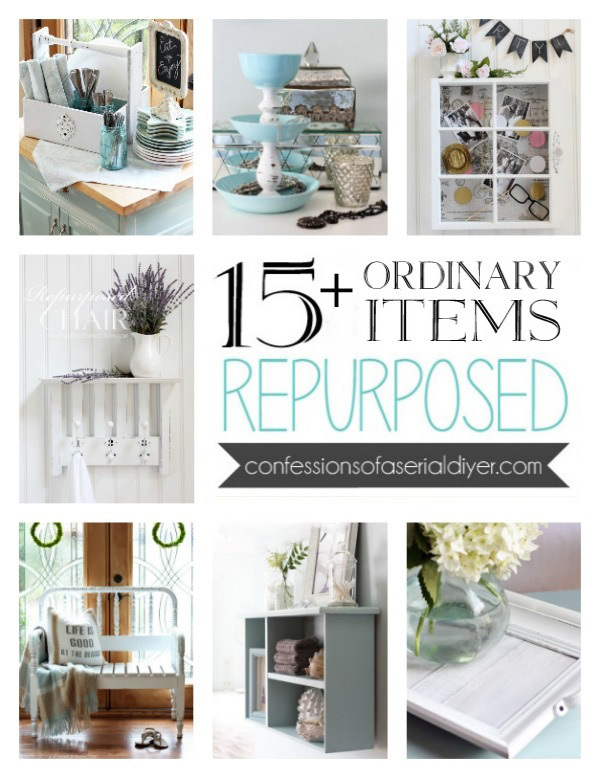 Your cabinet turned out beyond amazing! Thanx for sharing at THT. Hope to see you again this week. Beautiful job! The pieces that bleed through are such a chore though aren’t they? Between the smell of the shellac and having to do multiple coats, it’s enough to make you want to give up. But so worth it when you get results like this! Lovely, tranquil color combo. I have been keeping my eye out for a smaller, well built cabinet like this for a while to paint myself, what a great find, great price too! What a beautiful transformation! 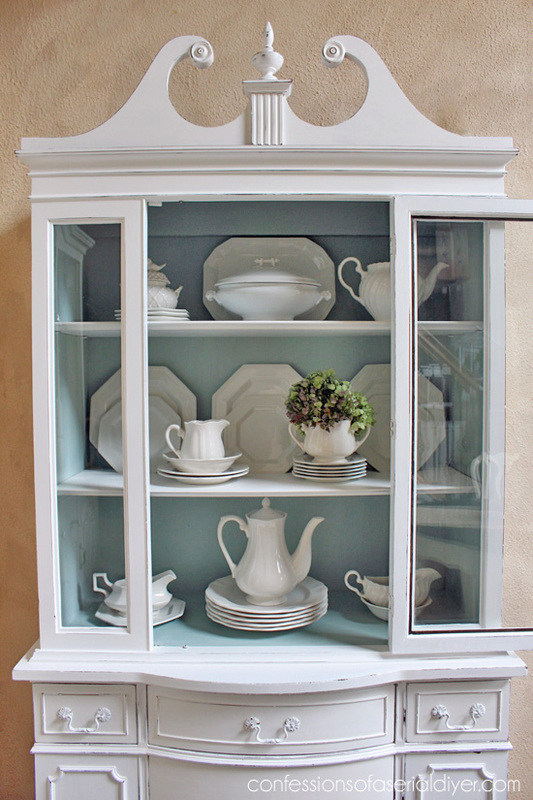 Love the combination of white and blue for display cabinets! This turned out so pretty, Christy! Your project will be featured at The Scoop this coming Monday night. Thank you for linking up! I can’t believe you got this for $69!!! I need to go shopping with you, for sure. 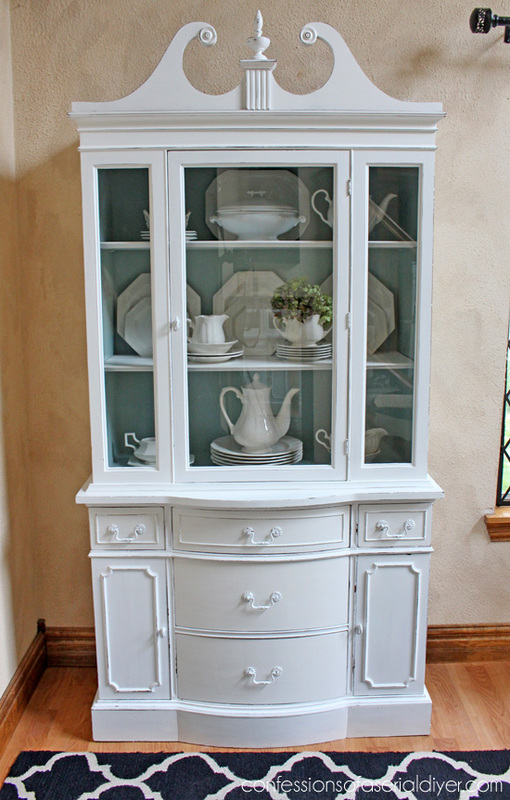 Our china cabinet is almost identical to this and I’ve been thinking of painting it for several years now. This might just be the inspiration I need! Thanks for sharing. You did a fantastic job! OMG! 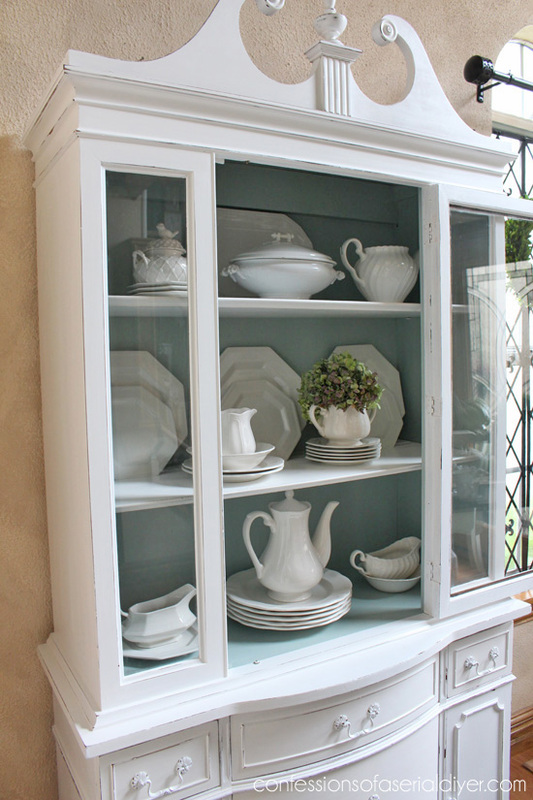 I just love your Duck Egg Blue and White China Cabinet!!!! Go to Home Depot and get the light kit that they sell. It is so easy to put 3 lights in at the top of the inside!! Really easy and you can make a touch switch so it comes on easily rather than to go find a switch or a toggle button. 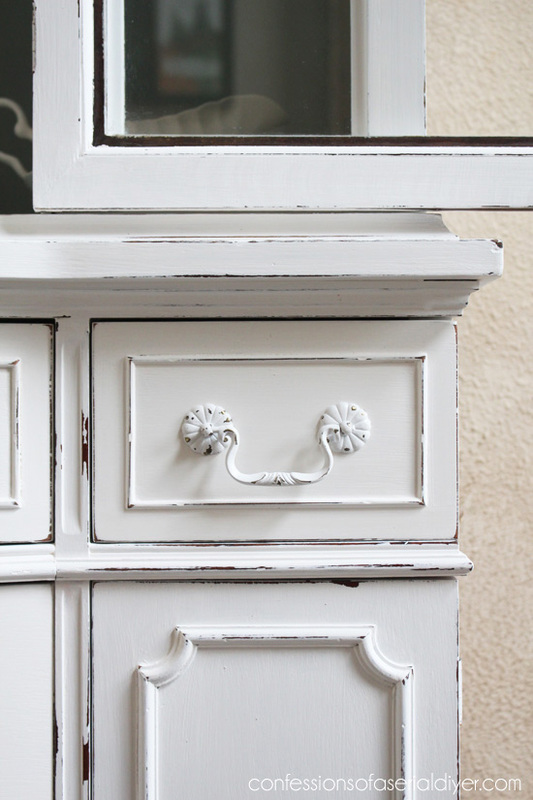 I love this hutch!!! I love white, everything white!!!! Beautiful!!!!! Great piece Christy. Love the colors you used. 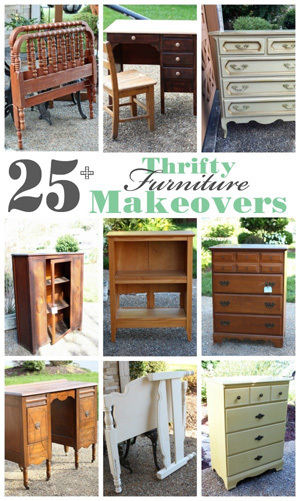 Hi–coming your way via Miss Mustard Seed’s Furniture Feature Friday. This piece is stunning, absolutely gorgeous. I think I fall in love with anything Annie Duck Egg Blue. 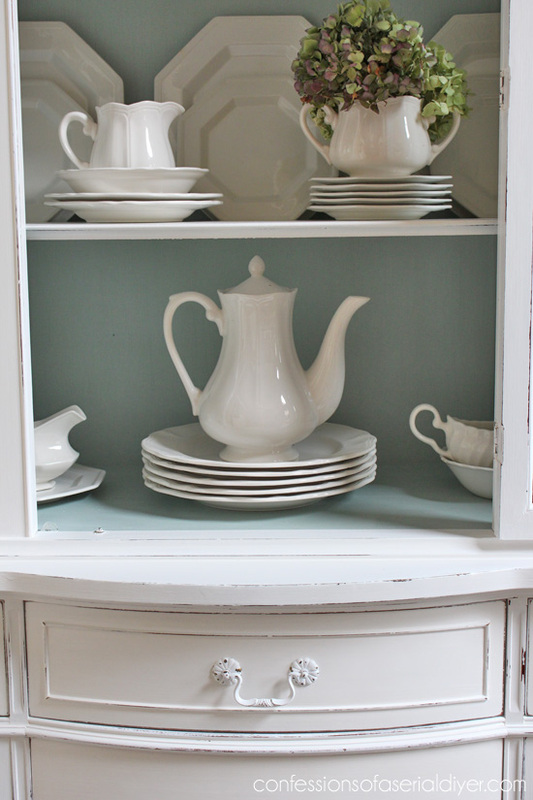 The styling with the white ironstone is just perfect. I love this!!! It turned out beautiful! 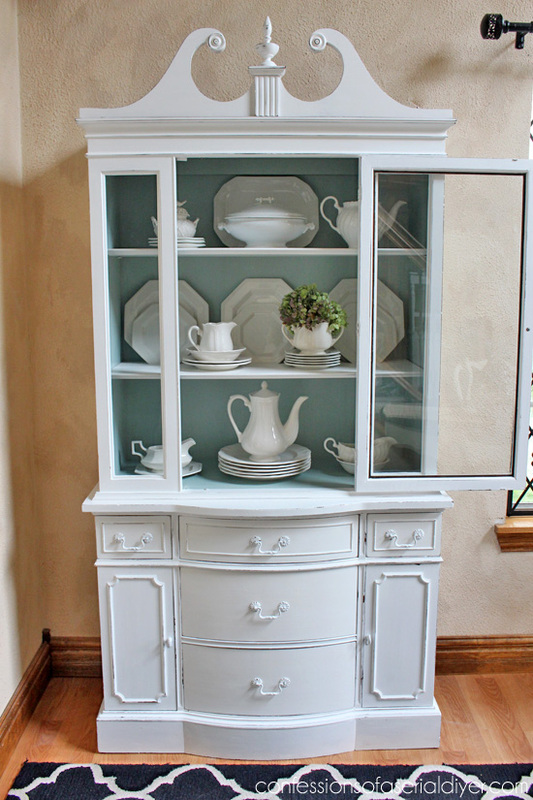 love the hutch, white and blue is great. 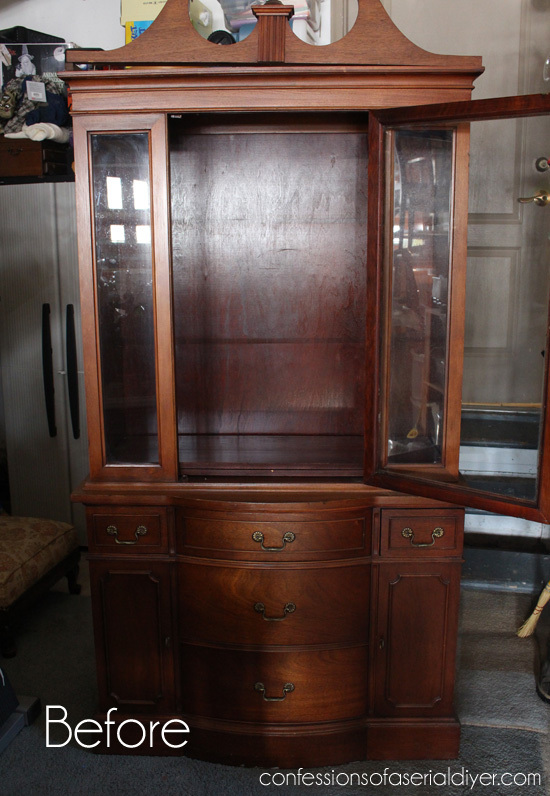 Always wanted a hutch never see anything in my area that is reasonable. 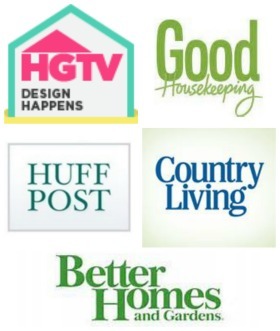 (any kind of table, etc to redo) You and many other bloggers are inspiring and make ya want to try things. Keep up the great work. Thanks so much, Donna Lee! I’ll admit I have a hard time finding reasonably priced hutches as well. This was a lucky find for sure!